The middle image is the test I sent them with various golds and blues, all Sulky rayons in 40 and 30 weight, so they could choose the colours. My Bernina loves Sulky rayons, as do I. Why the angels embroidery? Well, the mother of the baby boy that this quilt is going to lost both her own parents when they were very young, so the purchasers wanted the guardian angels as a symbol of her parents watching over their grandson. That tugged at my heart! I wasn't sure about embroidering onto a quilt that was already quilted, but I did some test samples, and got their approval. Once I saw the finished embroidery, it struck me that the angels appear to be in clouds, formed by the poofiness of the feathers. Amazingly, the lovely people who bought the quilt live in Ontario, my province! They were an absolute pleasure to work with. I love that this graphic looks good on the front and on the back in its mirror image. This quilt has an international connection, that is, between Canada and the United States: it will be travelling with the clients next month to California, home of the mother and baby boy to whom it will be given. 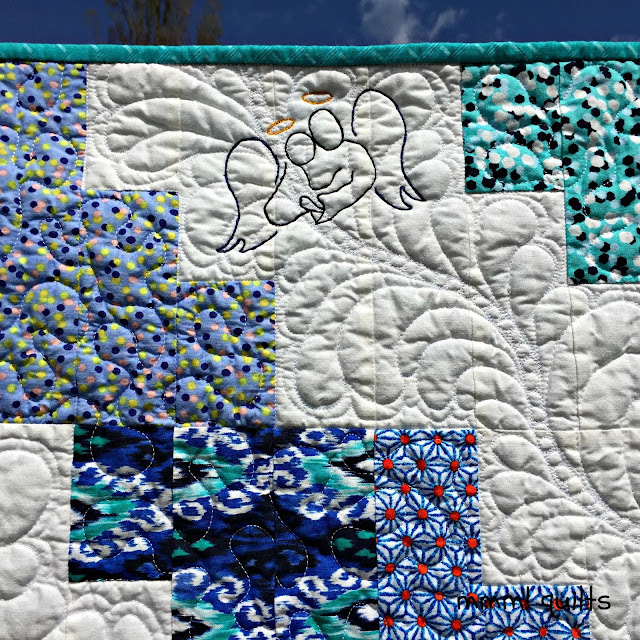 I just love thinking of the wee baby who will be wrapped in his blue skies quilt, wrapped in love from his family, both here and in heaven. And, in a little Canadian news (see what I've done here?! 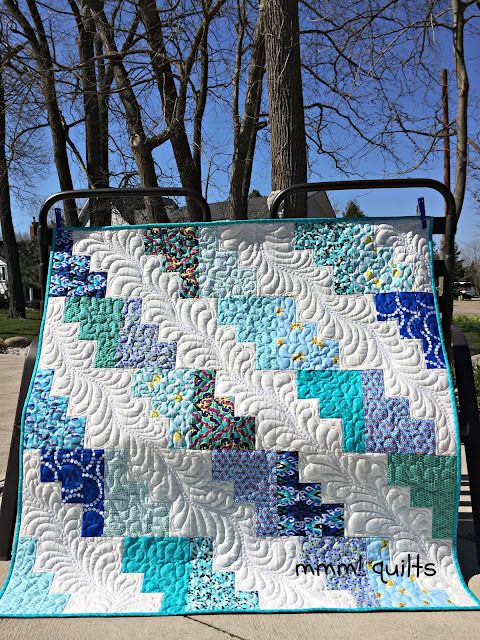 Love love when a post that seems like a schnozzle comes out a delicious, choreographed scrap quilt), I got almost 'only 3 blocks behind' in the 150 Canadian Women QAL (which is featured in Quilter's Connection magazine!) but that was yesterday, a Tuesday, the day of the week when Kat releases three more blocks, so I was 6 blocks behind, now 5 as I made one this morning! 85 - Elizabeth Smellie: awarded the Royal Red Cross for her exceptional service in military nursing during WWI, in 1923 was appointed superintendent of the Canadian Victorian Order of Nurses (VON); she also worked for the World Health Organization (WHO); served in WWII as matron-in-chief of the Royal Canadian Army Medical Corps, and was promoted to colonel. 86 - Ethel Stark: She has so many firsts: brilliant violinist, superb pianist, she was the first Canadian to win a fellowship at the Philadelphia Curtis Institute, only woman to sign up for conducting classes; first Canadian woman soloist on a programme broadcast across the US; founded the New York Women's Chamber Orchestra, founded the Montreal Women's Symphony Orchestra; in 1947 that orchestra was the first Canadian orchestra to play at the New Carnegie Hall; first Canadian woman to gain international recognition as a conductor. I have been saving this red/ivory music fat quarter for important female musicians--sure hope kd lang will be one of the future women. 87 - Kenojuak Ashevak: Inuit artist; her art (an icon) The Enchanted Owl, is on the commemorative $10 bill which was just released June 1! I love how many connections to Canada's birthday Kat has inadvertently (I think) done through her 150 incredible women project. There is a holographic image on that bill, the stained glass in our Parliament Buildings in Ottawa, so cool, and the prominent image of another Canadian in Kat's project, Agnes MacPhail. Anyhow, look closely at my block, the one on the bottom left. I knew I had some Aboriginal Canadian art fabric, left over from a quilt I made for my niece several years ago. I was so pleasantly surprised when I saw there was an owl image on it! It's brown, white and a bit of burgundy, but I had to include it, along with birch trees in winter, and snowflake white fabric. Hope you will be back tomorrow for a most momentous occasion! 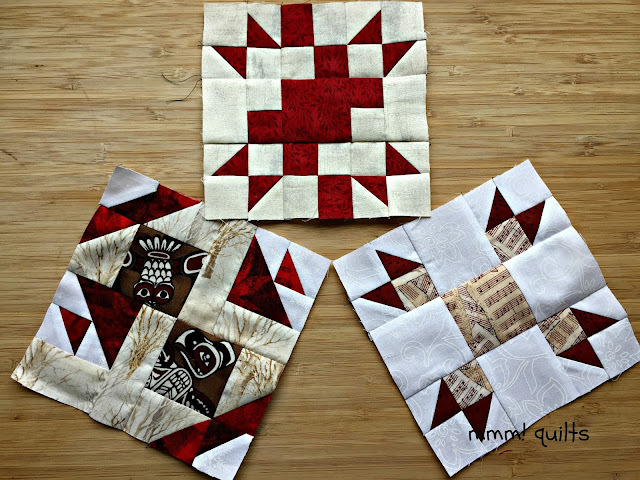 The final reveal and parade of Freefall quilts from my Freefall Quilt Along. There are some fabulous prizes to be had, and remember flimsies are fine! I've already seen some finishes...WOW! Stunning quilt again my dear sister!! And love love love the cow! Stats are great!!! Love the quilt and that story, what a treasure. Blue for a boy, and the grandies looking down, I have always believed in that. Tomorrow!!! I have quilted, the flanged border is sewn on, just the matching up of that diagonal seam. ( What a lot of fiddling, I have already tried THREE times !!!) flip it over and stitch down, and I can then say " All Done" !!! Love the ones that are finished, this was a fabulous pattern. 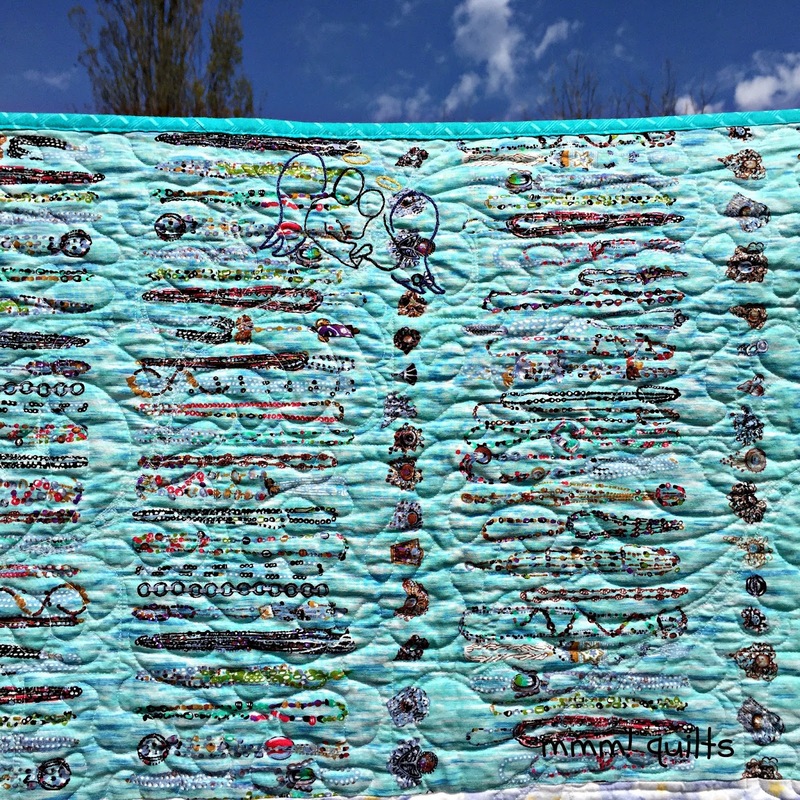 Thats a beautiful story to go with the beautiful blue skies quilt Sandra. Congrats on your first sale! I can only wish yet. Congrats on the sale, Sandra! And it's so neat that it has such a sweet story attached to it. Bravo to you for being able to personalize the quilt for your clients. I love how your mind works, weaving all your quilty news together in your posts. Congratulation on your sale, Sandra. 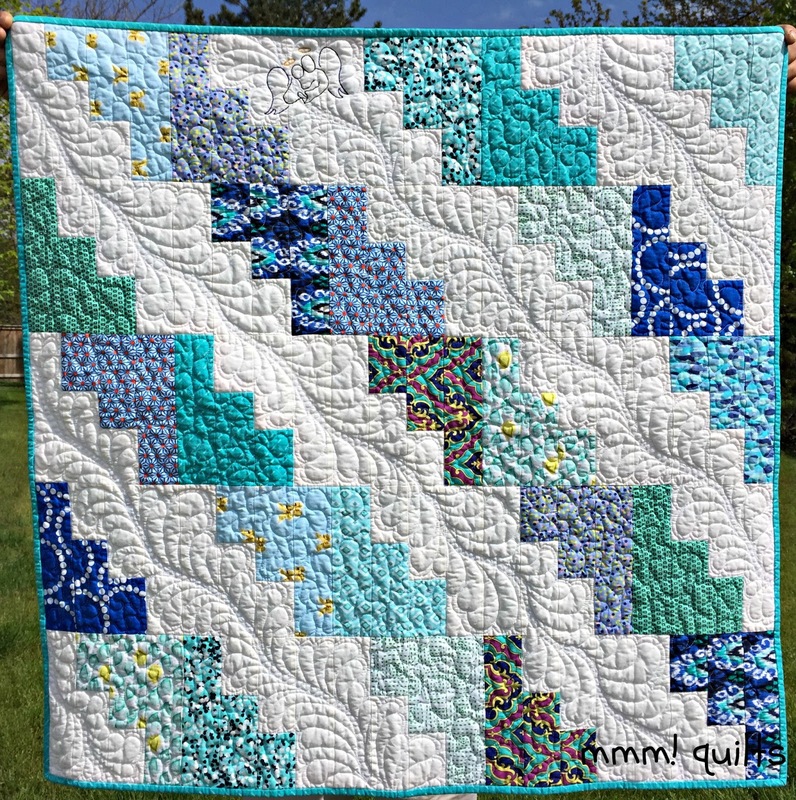 That is such a pretty quilt and now nice to be able to personalize it in such a special way. Your Canadian blocks continue to look amazing. Your FMQ embroidery is amazing. Congrats on your first sale on Etsy. Congratulations! 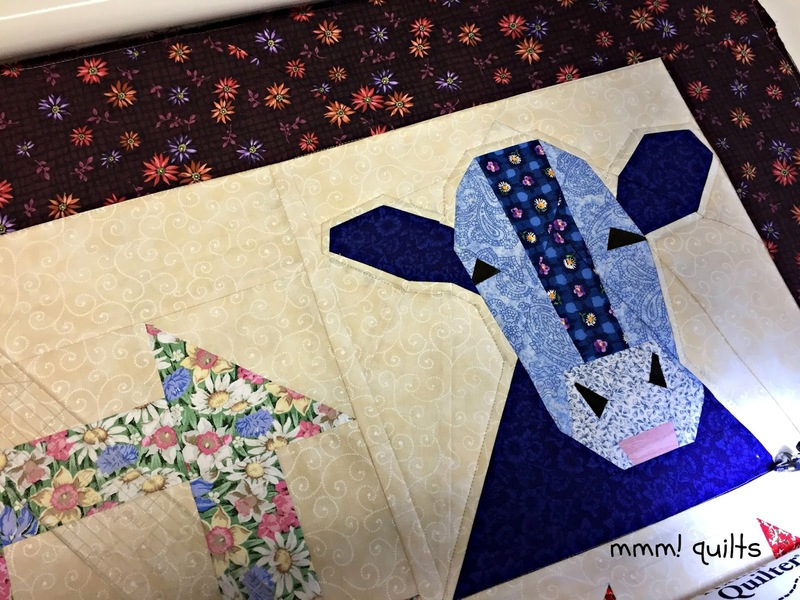 Aren't you happy that your beautiful quilt is going to such a wonderful home to comfort a baby!! Beautiful quilt and what a sweet addition to it! Beautiful and I love how you added to it. congratulations!